Preludes, Op. 1, Nos. 1, 2, 5 and 7; Masques, Op. 34; Krakowiak (Four Polish Dances, Op. 47). Nocturnes, Op. 55, Nos. 15 and 16; Polonaise No. 4, Op. 40/2; Ballade No. 4, Op. 52; Etude in A flat major, �Harp Study�, Op. 25 No. 1. 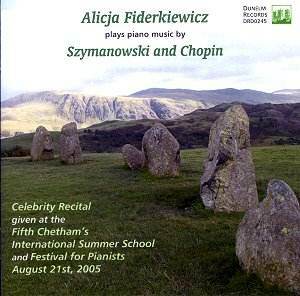 Alicja Fiderkiewicz is an outstanding pianist who deserves to be much more widely known. In full command of technique, she is able to project vivid interpretations especially in music of composers from her own country, Poland, as recorded on this CD. The performances were recorded �live� at her celebrity recital given at the Fifth Chetham�s International Summer School and Festival for Pianists, by kind permission of the Director of Music. The recital had an added significance in being dedicated to Alicja�s sister, Elzbieta Fiderkiewicz-Mirska, who died of cancer in 2005. I feel that this gave impetus to the wonderful performances recorded here. Two groups of pieces by Szymanowski are followed by four pieces of Chopin. Finally there are two encores, one by each composer. Four of Szymanowski�s Nine Preludes. Op. 1 (Nos. 1, 2, 5, and 7) are an example of his early piano music (1900) composed while still in his teens, yet already memorable in lovely ideas and pianistic writing, with No. 5 making an exciting, powerful contrast to the other three. All four are played with much feeling and great control of dynamics. The later set of Masques, Op. 34, of 1916, consists of substantial, virtuoso pieces, and these performances superbly bring out the contrasts - from delicacy to great power - between them and within each piece: �Shéhéherazade� - whose quiet ending sounds exquisite here, �Tantris, the clown� and �Don Juan�s Serenade�, which sounds really brilliant. The two Nocturnes by Chopin are given lovely, poetic interpretations, followed by the powerful Polonaise No. 4 in which the main theme is played with great majesty in the bass, with well-controlled, delicate contrasts later on. For me, the highlight of this CD is the performance of Chopin�s Ballade No.4 � a truly great, moving and memorable reading with a wide range of expression, feeling, rubato, pedalling, control of the structure and brilliant playing in the closing section. The two encores, by Chopin and then Syzmanowski, make a delightful, well-contrasted conclusion to this recital. Rarely is there any sound from the audience, and the recording of the piano is just right! I feel it to be in the same room as me. The CD booklet is excellent, full of useful notes on the music, the pianist, and with quotes from excellent reviews of other recordings and performances that Alicja has made. The photographs are well produced. Just one small point: the Polonaise No. 4 is in C minor not C sharp minor, but I have no doubt that this will be corrected in the next printing of the booklet and inlay. Very highly recommended in every way! The Warsaw-born pianist Alicja Fiderkiewicz is a distinguished concert artist who has, for some years, taught piano at Chetham�s School of Music in Manchester. This CD is a memento of a celebrity recital at Chetham�s on August 21st, 2005. In this she combines music by Poland�s two greatest composers, certainly its two greatest composers for the piano, Chopin and Szymanowski. Even though the latter was born in 1882, 33 years after the death of Chopin, it would still have been surprising had he not been influenced by his great compatriot. That influence may certainly be detected in Szymanowski�s very early Op. 1 Preludes, of which we hear four highly agreeable examples here. More characteristic of the mature composer are Masques, Op. 34, dating from 1916. The first of these, "Shéhéherazade", suggests storytelling, though there is no discernible parallel with Chopin�s Ballades - of which the fourth and last is also on the disc - dramatic though both of them are. I should add that the drama is excitingly realised. The remaining Masques are "Tantris, the clown", perhaps the scherzo of the set as we might guess, though wistful episodes suggest the depression many clowns have endured, and "Don Juan�s Serenade", the most Debussy-influenced of the three. Szymanowski, while remaining very much his own man, admired both Debussy and Scriabin, another whose early piano music is strongly Chopin-influenced. The Chopin here is outstanding; both Nocturnes are superbly poetic, the C Sharp Minor Polonaise, understated if anything, shows deep musicality and the F Minor Ballade is stunning. The applause which follows this presumably persuaded Miss Fiderkiewicz to add two short encores, one by each of her composers. The "Krakowiak" (1926) is the latest Szymanowski on the CD but its lines, so reminiscent of a Chopin Mazurka, seem to take us back to where we began. The recording is clear and natural, with no extraneous noise that I could detect; Chetham�s audiences must be among the most silent and best behaved of all! I have no hesitation in recommending this release to lovers of both composers.